"My family and I wanted a dog and while we have the time and work from home, we didn't have the capacity to train a puppy from scratch. I did a lot of research and found TOTAL K9 ® based on their reputation and feedback and approached them to discuss what we were looking for. Rob absolutely nailed it from the very first conversation exactly the right kind of dog for our family. 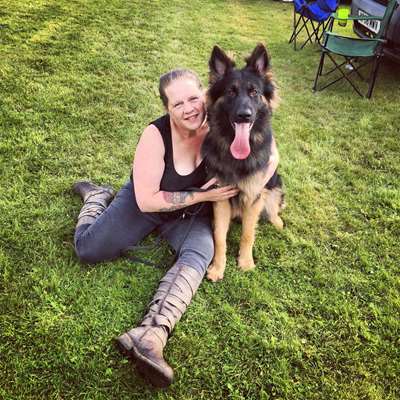 He suggested Rebel, a stunning 16 month old Sable German Shepherd based on the information I gave him and he couldnt have been more right on the perfect fit for us. We needed a dog that was very much a family pet, good with young children and obedient so that our young son could walk him. 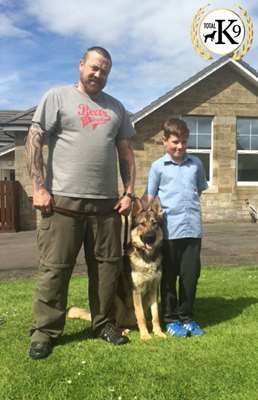 As we are in Scotland, in the early days Rob kept us up to date on a daily basis, sending us videos to see the progress made with Rebel's training and couldn't have been more helpful throughout the process. The handover was excellent, Rob spent a long time with us going through the commands and giving us advice and wouldnt leave until we were 100% happy. 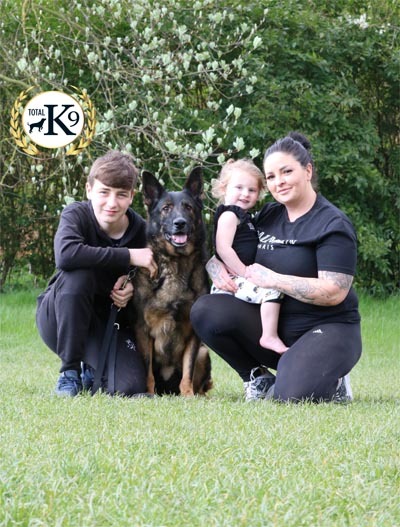 Rebel has now been with us for 3 months and we just couldnt be without him, he is everything Rob said he would be and more and the after care and ongoing support we have had from TOTAL K9 ® has been outstanding. Rebel is the sweetest natured dog, so loving but incredibly obedient and a pleasure to have in the house. 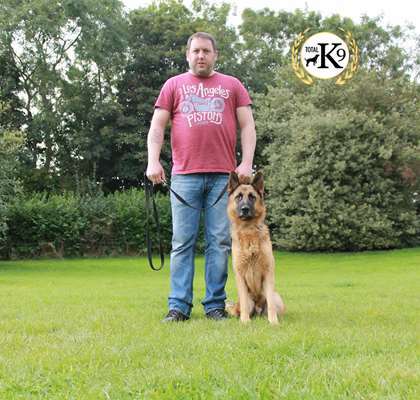 I cant recommend Rob and the team at TOTAL K9 ® enough for their professionalism and outstanding quality of service." 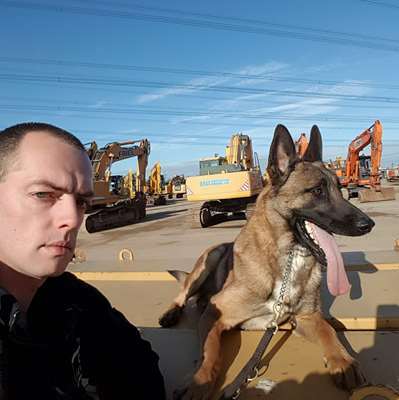 "When I decided to get a protection dog I contacted many companies to ensure I was fully aware of the services provided by each. After consideration and speaking to Rob, Total K-9 were head and shoulders above the rest. I purchased Bear after providing Rob with a full description of my family, hobbies and requirements. Bear is a wonderful family dog and companion and is exactly what was wanted. I will be purchasing a second dog from them in the future and have no hesitation in recommending them." "Rob and his team worked wonders with our American bulldog, he went as a boisterous pup and came back after a week walking great ,sits, lays down and even waits on command until you go back to where you left him or shout him to you. Cannot thank these guys enough, truly are amazing and would never take a dog of mine anywhere else." 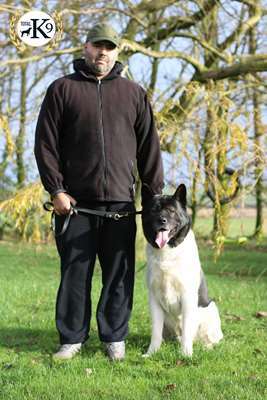 "I was supplied with Wolf from Rob 2 years ago now and can honestly say best 2 years of my life, after loosing my husband an just being in a secluded home with my 4 young children I decided to contact rob, he was so professional listened to what I wanted an needed and picked out the perfect dog for us, after a full hand over wolf came straight into family like he was meant for us, he is so protective , very vocal when needed, can back it up with a powerful bite an honestly say he would protect us with his life but he is also the most loving family dog I could want, brilliant with my children especially with my little girl who is 2, he sleeps next to her, lays by her when she plays, she brushes his teeth, I had to spend few days in hospital so wolf was staying at my parents house with the children an he went straight to protecting there home too, my dad has dementia an had a fall and wolf went to my mums room an kept barking an licking her till she followed him to find dad had fallen , he really is just an all around one of a kind amazing dog an it’s been a blessing not to be scared in my own home knowing I can always rely on my fur baby, thank you Rob and team don’t think you know how much your dogs change peoples lives! " "We got Lucifer from Rob 6mths ago, he is an amazing boy who has settled into our family. Rob's hand over was excellent and he went through everything in detail. We are sending Lucifer back to Rob while we go on holiday and would definitely look at buying from Rob and his team again." "Superb service from start to finish great people with a true passion for dogs. Don't go anywhere else with your canine needs." "Excellent service. Rob certainly knows his stuff and will help you as much as he can." "Brilliant service, very friendly, found my perfect solution, thank you. " "Professional, impeccable customer service from all the team and beautiful dogs for all situations. No pressure selling or 'any dog will do' attitude, they are very specific and take the time to get to know your situation to best recommend the right dog for you. Cannot praise them enough!" "Great dog trainers. 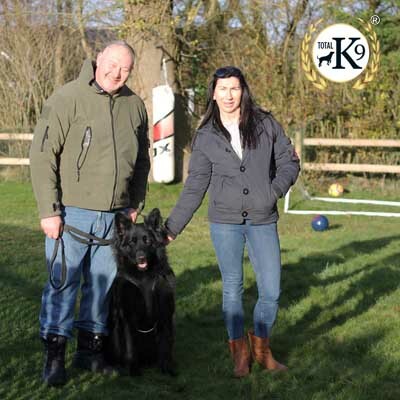 Great service I often take my dogs to TOTAL K9 for security dog training." 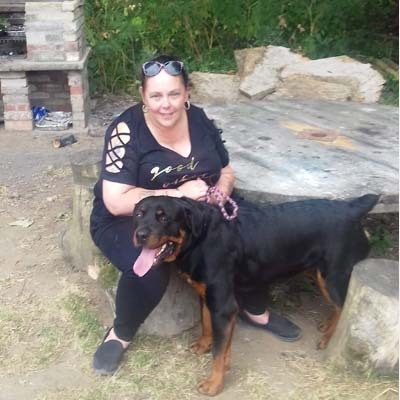 "Hi, I got my stunning Rottweiler off total k9, he's part of the family now, he is good with other dogs and great with kids, I 100% recommend the business very trustworthy and helpful, I wouldn't be without tank he's great!! " "Very friendly and great service, I found my perfect solution thank you!" "Previously having bogus protection dog trainers.. I came across Rob from Total K9 who in my mind is the best protection dog trainer out there.. Straight up no lies or anything if rob can train your dog he will tell you on your first visit... I drive all the way from Nottingham just to see him so that should give you a idea plus his prices are awesome and reasonable no ripping off or anything. Thanks again Total K9, see you again soon. " "Highly recommended! We were looking for a farm guard and guardian dog. 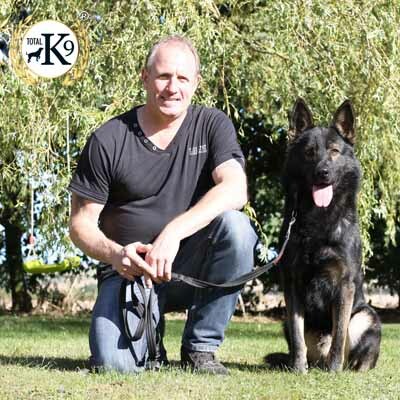 Rob and his team are very professional and obviously put a lot of effort and training in to the dogs as he is very well behaved. The dogs are well selected and the team really try to get the right dog for the owner and their situation. Compared to the dogs we have previously tried to train ourselves the different is night and day." 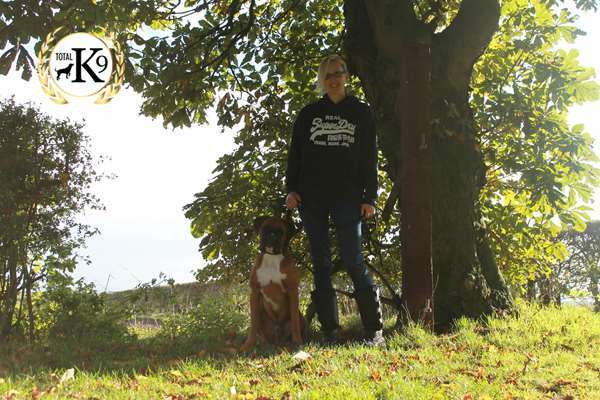 "I booked my puppy staffy in 20 weeks for a quick training session. just to help correct and advise on her unwanted behavior. After giving another trainer a go first. 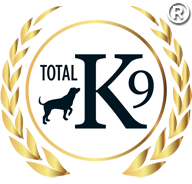 I hadn't heard of TOTAL K9 ® I didn't like the trainers attitude, but then my vet recommended TOTAL K9 ®. I really wish I went to TOTAL K9 ® sooner, they are brilliant, nice people to be around and also are nice to dogs. Great value for money, and after an hours session, it cured quite alot of things, and also helped me see where I was going wrong. Its been 7/8 hours since training, and she has improved already! Thanks so much for all of your help with Pepsi." "Awesome dog trainers, providing extreme dogs!!! Real dogs for real people!!!! High drive!!!!!" "I left my boy X with Total K9 for six weeks. He was nine months old and he was quite aggressive to other dogs and people at this time. X had few weeks training previously with a completely useless dog trainer in London.This guy did advise me that my dog is really nervous and is not going to be a good guarding dog. I did not give up on my boy and did my research ,friend of mine advice me about Total K9 Ltd. I have to be completely honest that Rob and his professional team have done miracles with my boy . He did told me that he will see how X is doing for two weeks , and will advice if he is good for further training . After the two weeks Rob said that X is really good dog and not nervous at all. We left him for four more weeks and I had back a completely different dog. Very good obedience, not aggressive and really good behaviour.A massive thank you to Rob and his crew for their hard and professional work." "Putting Kushi in with Rob and the gang for a 4 week residential has been a life changer for us. I can't recommend the company highly enough. Kushi was reactive with any dog, cat, anything with 4 legs. 4 weeks may seem like a long time but we are so relieved we went with the longer timescale to really address his issues and create good habits. This is day 2 back at home and I've just taken him to a park FULL of dogs. We stayed 10 minutes, I followed everything we were taught (which is really easy instruction by the way) and Kushi was an absolute star. 15 minutes at that park tomorrow and we will increase every day. He was off the lead this morning in an area that he knows there is loads of rabbits. He is a lurcher so there was never any stopping him before he went to Total K9. This morning, I took him off the lead and he walked by my side. No problem. Seriously, if you want to do this then you need to be prepared to listen and put into practice what the team say you should do when you get your dog back. I am really looking forward to our next walk whereas I used to dread taking him out. Amazing, amazing, I can't put more than 5 stars, if I could I would. Eleven out of ten and then some." "These guys are excellent. I had just spent a lot of money having my dog in boot camp else where as for some reason I'd not seen these. 3 weeks my dog was away at boot camp and came back possibly worse than she went away. In one hour session they had cured Eva's lead walking which the other guy didn't do in 3 weeks. I really wish I had found these earlier before I'd wasted my money I would certainly sent Eva to them instead. If you have problems with your dog get in touch with these I really recommending them. We will have to save up again and send Eva here. Thanks again." "Providing personal protection, security, police and prison dogs to Wales, Scotland, England... in fact the entire UK. Plus providing obedience training and behavioural training to working dogs and pets. Plus providing fully trained adult dogs and foundation trained puppies of any breed ... what more can I say. This is the number one business for the total canine solution! Highly recommended. " 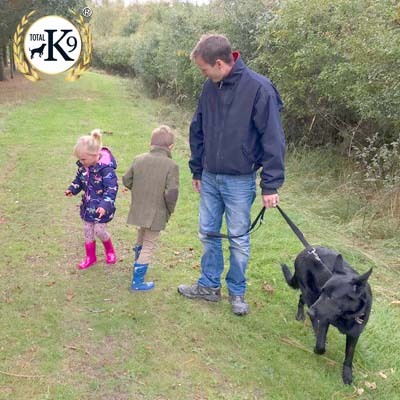 "Rob offers a 5 star service when it comes to dog training and you can see from the start the not only he is skilled but he loves dogs very much." "Thank you Rob!! Ive been able to walk my dog myself for the first time since she was little!! the mega mental Marley has now gone back to my Bella!! Highly recommended!!!!" "This is truly a professional setup. 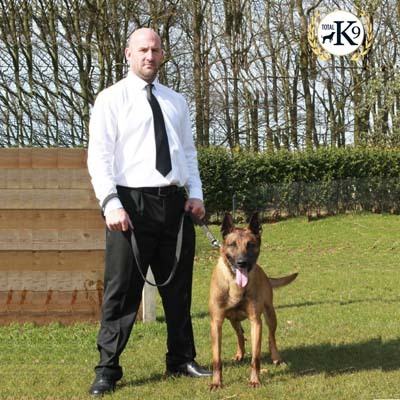 Providing Personal Protection Dogs, Security, Police and Prison Dogs. They even supply foundation trained puppies and adult dogs. Dog obedience and behavioural classes are available through the entire UK through their pick and delivery service. With a dog boot camp!"